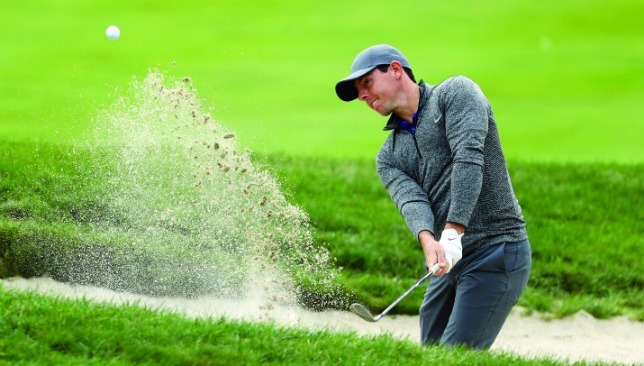 McIlroy showed impressive resilience to recover from a disastrous start in Boston. There is no denying the fact that after Tiger Woods, Rory McIlroy remains the second biggest draw in golf. That was in evidence once again. Just like the former American world No1, there seems to be extra vitality in the celebration of a McIlroy win by the fans, just as there seems to be extra scrutiny in whatever he does. You know someone is important to the sport when each move of the athlete is analysed and debated. Be it golf-related – like that famous switch to Nike clubs, or the walkoff at the 2013 Honda Classic – or personal issues like his engagement and subsequent break-up with Caroline Wozniacki, which country to represent in Olympics or even his training routine in the gym, people always have an opinion on McIlroy. Obviously, these last few months, it has been about his refusal to go to the Olympics, and his issues with the putter. When he made the decision on Rio, McIlroy did look irritated by the backlash he faced and some of his remarks seemed casual and offensive. As for the putting, he had constantly been outside the top-100 of the PGA Tour’s overall putting stats despite being in the top five of the overall driving stats. And while everyone has been going ga-ga over the turnaround in his putting during the Deutsche Bank Championship, there were a couple of other points that I thought were significant as he beat Paul Casey by two shots at TPC Boston for his first PGA Tour win after 477 days. It really was impressive how he kept at it after the disastrous start he had to the tournament. After the first three holes, McIlroy was fourover. In tournaments on the PGA and European Tour, that’s dead and buried as far as chances of winning the title are concerned. Many experts feel it was the slight adjustment he made to his putting grip on the second day that led to his resurgence. I feel it was how he willed himself to fight back to even-par score at the end of the opening round that kick-started the resurrection. I thought it was remarkable that he still believed in himself despite that horror start. As for the putting, even the way in which he went about making the change, showed the terrific self-belief he has. The week before The Barclays, McIlroy changed his putter, switching to Scotty Cameron. And then at the start of Deutsche Bank Championship, he changed his putting coach and started working with Phil Kenyon. When asked why he chose Kenyon, McIlroy said it was because Kenyon knew how to work with the existing stroke. All his clients have very different putting strokes, which meant he wasn’t working to a fixed blueprint. Not for one moment in all these months of tribulation, did McIlroy think of changing his own putting stroke. He knew throughout he had the right gun, all it needed was minor re-caliberating. Once again, I felt he displayed exceptional self-belief. While we are on McIlroy, there is something I wanted to point out about him and Olympics. I thought it was very classy of him to admit he might have been wrong about golf getting back into the Games. Not many people have the courage and character to do that. And finally, no prizes for guessing who had the biggest smile as McIlroy went about his business on Monday. This was just the boost European captain Darren Clarke was looking for three weeks before the Ryder Cup. The injury to Henrik Stenson, and the form of McIlroy must have been Clarke’s biggest worry ahead of the Hazeltine clash. They are the two highest ranked players in the team and the undoubted leaders on the course. It was important they performed well in the run-up to the tournament, and Clarke got exactly what he was hoping for. During the EurAsia Cup played between Europe and Asia at the beginning of the year, European captain Darren Clarke had made it very clear that he was going to depend heavily on statistics come the Ryder Cup. That tournament in Kuala Lumpur was when we came to know about the company, 15th Club, a group of guys who have turned golf into a complete game of numbers. They have researched and analysed all kinds of stats and Clarke admitted later that many of his pairings that week were based on what the computers churned out. American captain Davis Love III seems to be going the same way. He told the media categorically that he is going decide on his wildcards and pairings based on what his stats team come out with. You can understand the importance of basing your judgement on facts and figures, but I certainly don’t want captaincy to be dictated by computer algorithms. Hopefully, human input and gut instinct will also play a part. The more I look at it, the more I am convinced that this American Ryder Cup team will finally be able to redeem itself. Davis Love’s team is not complete as yet, while Darren Clarke has gone past the worst part of being a captain – naming his picks and informing those who haven’t made it to Hazeltine. This year’s majors have been divided between the two teams – Danny Willett and Henrik Stenson at the Masters and The Open, and Dustin Johnson and Jimmy Walker at the US Open and the PGA Championship. But that’s where the similarity ends. As of now, with only eight Americans confirmed for the team, they have the two highest ranked players in the field – world No. 2 Johnson and No. 3 Jordan Spieth. Europe have the next two highest ranked stars – No. 4 Stenson and No. 5 Rory McIlroy. But in No. 41 Thomas Pieters, No. 42 Andy Sullivan, No. 46 Lee Westwood, No. 48 Matthew Fitzpatrick and No. 50 Martin Kaymer, they also have the five lowest ranked players in the 20 who are assured of a place in Hazeltine. Even more worrisome is the fact that McIlroy is struggling with his putter, while Stenson has injury concerns with his right knee flaring up again at the most inappropriate moment for Clarke. 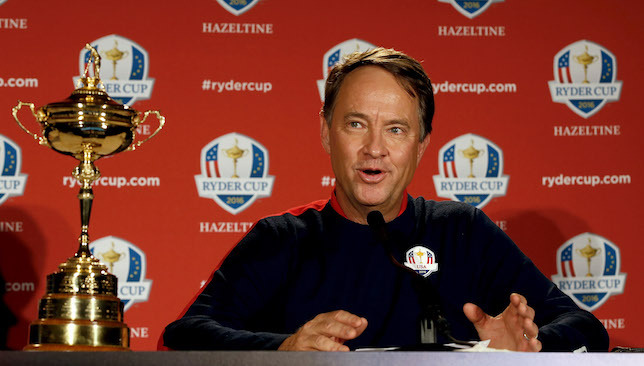 But, of course, we all know from past experience that reputations and rankings don’t matter much in the Ryder Cup. On the other hand, good pairings do make a huge difference. And while Europe will feature six experienced stars with six rookies – which is a good mix – Americans seem to have players who complement each others’ game. If we go with the widely held belief that Rickie Fowler, Bubba Watson, Matt Kuchar and JB Holmes will get the nod from Love, then there are six players – Dustin, Phil Mickelson, Brooks Koepka, Patrick Reed, Watson and Holmes – who are renowned for their power game, coupled with six of the most consistent and straight hitters in today’s game – Spieth, Walker, Zach Johnson, Brandt Snedeker, Fowler and Kuchar. The Americans really are a great mix of skills and experience right now. They are massively hungry and they do not want to disappoint their home fans. Miracles like Medinah are always possible in Ryder Cup, but I am going to go for 16-12 in Team USA’s favour this year. The tournament is just three years old and at €1.8 million, it offers one of the lowest purses among the Tour events in continental Europe, but Made in Denmark is fast becoming a must-play event on the schedule of many players. There were 78,000 good reasons last week why this tournament has become so popular so quickly. That’s the number of spectators who turned up for the event this year, and each one of them contributed in a very special way. The par-three 16th hole at Himmerland Golf Resort is fast becoming as famous as the 17th at TPC Sawgrass or the 16th at TPC Scottsdale. The thousands of fans on ‘Himmerland Hill’ provided the most unforgettable moment of the year when they all held up European flags as Ryder Cup captain Darren Clarke approached the green on day two. But even otherwise, they appreciated good shots, and unlike Scottsdale, did not boo bad shots. Birdies and eagles were greeted with squeaking noise of the ‘Birdie Duck’, a rubber toy that could be purchased for 50 Krone (appx Dh27), with proceeds from sales of the ducks going to various charities. The organisers not only got the fans engaged with golf, but also provided a lot of off-course, and post-round activities to keep them happy. The tournament, given its proximity to PGA Championship and FedEx Cup, is not very well scheduled to attract the big stars who ply their trade on the PGA Tour, but if they continue to get such good word-of-mouth publicity from the players, I won’t be surprised if the European Tour is forced to change it to a more favourable time of the year. Japan’s ‘Bashful Prince’, Ryo Ishikawa returned to competitive golf in style when he won the Rizap KBC Augusta on the JGTO Tour. Ishikawa has struggled with his lower back and hasn’t played any tournament since making the cut at February’s Phoenix Open. KBC Augusta was his second outing after making his comeback in July in Japanese PGA Championship, where he missed the cut. Ryo Ishikawa won his 14th tournament on the Japan Tour today. He's been out for 6 months, and got married in March. The victory improved him to No. 140 in the world rankings. “The fact that it put a kink in our schedule this year irritates me. To mess with the four tournaments that matter most because you’re at the Olympics, I’ve got a strong, strong disdain for that.” – Two-time major champion Zach Johnson doesn’t hide his displeasure for Olympics golf. “Today, you have become the daughter of the Korean people.” – On the other side of the world, an emotional grandfather told Inbee Park as she arrived in Incheon with her Olympics gold. The 2016 European Ryder Cup team was announced in full on Tuesday with captain Darren Clarke selecting Lee Westwood, Martin Kaymer and Thomas Pieters as his three wildcards for next month’s defence of the trophy at Hazeltine. Here, we take a look at some of the best moments featuring each of the 12 members of the European team. Rory McIlroy may have underperformed in 2016 but he has Ryder Cup pedigree. The Northern Irishman teamed up with compatriot Graeme McDowell to take the first point of the 2012 Ryder Cup at Medina Country Club in Chicago, IL. One chip that he had on four really stood out and capped off a solid morning round for the two Europeans. It’s been a great year for Danny Willett, who followed up his Dubai Desert Classic win in January with victory at The Masters to claim his first Major. At Augusta this year, the Ryder Cup rookie saw his excellent form come to fruition. A three-time winner in Dubai (once at the Desert Classic and twice at the DP World Championship), Stenson sunk the winning putt for Team Europe on his debut in the 2006 Ryder Cup. It doesn’t get much better than that. Chris Wood rose to prominence in the 2008 Open while still an amateur and has come a long way since. His Ryder Cup place was no doubt secured by his triumph in the BMW PGA Championship in May where he hit a hole-in-one on hole 14 on Day Four. Having been a part of the triumphant Walker Cup team in 2011, Sullivan won his first two European titles before Ryder Cup qualifying started, but then added the Portugal Masters in October last year and pushed McIlroy all the way at the DP World Tour Championship in Dubai. Sullivan’s walk-off eagle on the 18th hole at the 100th Open de France was a real high point given that the 471-yard hole was named the toughest on Tour in 2015, outside of the Majors. Fitzpatrick won his maiden European title in the British Masters last October but suffered a loss of form after winning the Nordea Masters in June. He shot a four-under-par 68 to take a five-stroke lead into the final round of the Nordea Masters in Sweden. A highly consistent season which included back-to-back runners-ups at Qatar and Dubai probably secured his place. In the second round of the 2016 World Golf Championships – Dell Match Play, Rafa Cabrera Bello won his match with a 72-foot birdie putt from the fringe on the par-4 15th hole. With seven caps to his name, Sergio Garcia has plenty of Ryder Cup pedigree. One of his best moments in the competition came two years ago. Rory McIlroy holed a 45 foot putt to keep the match alive before Sergio hit a wonder shot out of the rough on the 18th. Justin Rose played all five matches at Medinah in 2012 and again in 2014, finishing unbeaten and as Europe’s top scorer. He claimed gold in the Olympics in Rio as well after a thrilling battle with Stenson. 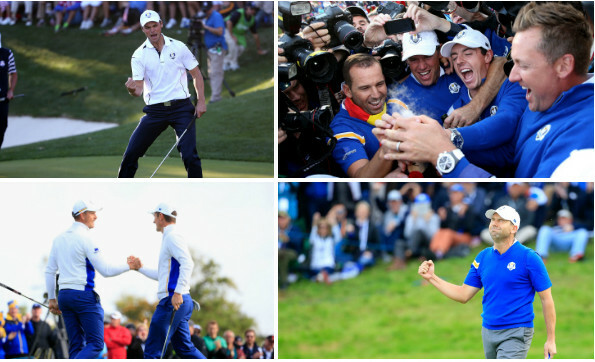 One of his best moments in the competition came on the final day of the 2014 Ryder Cup at the 13th hole. Boasts vast experience and always expected to be selected by good friend Darren Clarke if he failed to qualify. Did need to show some form to justify his place and was second in the Masters. In the second round of the 2014 CIMB Classic, Lee Westwood aced the par-3 11th hole. Discovered his best form at the right time by finishing fourth in the Olympics, second in his defence of the Czech Masters and then winning the final qualifying event in Denmark. The Belgian’s big hitting will be an advantage at Hazeltine. He produced a brilliant finish to claim his third European Tour title in the Made in Denmark event earlier this year. Admitted his form was so poor he would not have picked himself in 2012, but qualified automatically and ended up securing the winning point. Won both the Players and US Open by leading from start to finish in 2014. Here’s that famous putt to retain the Ryder Cup for Europe in 2012. #360debate: Should Pieters get Ryder Cup nod?